Join StageScreen for another 5-day Summer Intensive in Burton on Trent in August 2019! Fresh off the back of the successful Greatest Showman Intensive Program join us for MEAN GIRLS! 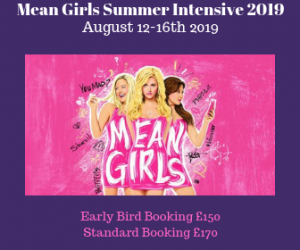 Working with songs and scenes from the brand new Broadway smash hit Mean Girls you will spend 5 days working on voice, acting, dancing and ultimately starring in your own music video of one of the numbers! There will also be work in progress presentations at the end of the week. The music video will be released to our YouTube Channel for you to share with family and friends at the end of the week. Book Your Place By Clicking Here Now! We will be doing a number of the musical numbers over the week including acting, dance routines and singing.